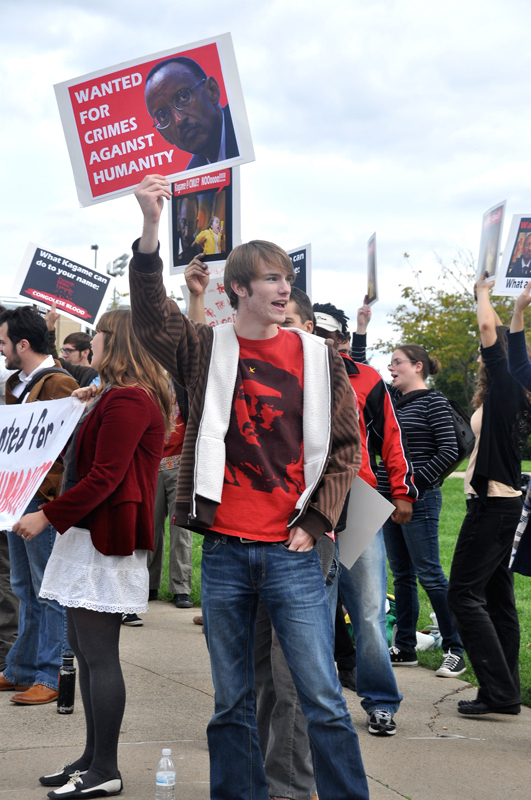 Protesters gathered outside the University Center to speak out against Carnegie Mellon’s partnership with Rwandan President Paul Kagame during Kagame’s address last Friday. Carnegie Mellon unveiled plans to open a new center in Rwanda which will provide graduate education in information and communications technology. University President Jared Cohon called Kagame and his dedication to the program “visionary,” saying that Kagame’s leadership is one of the reasons that Rwanda has been able to achieve peace and stability after the Rwandan genocide in 1994, in which at least 800,000 members of the minority Tutsi ethnic group were killed by members of the majority Hutu ethnic group. The protesters, however, believe that Kagame has committed too many human rights abuses for any partnership with or endorsement of him to be acceptable. One concern they cited was the lack of free speech in Rwanda. Last year, Reporters Without Borders ranked Rwanda 169th out of 178 countries in its worldwide freedom of the press index. According to an Amnesty International factbook from 2011, during Kagame’s 2010 re-election campaign, he shut down two newspapers and imprisoned two journalists and a political opponent, citing national security concerns and “divisionism” in their rhetoric. 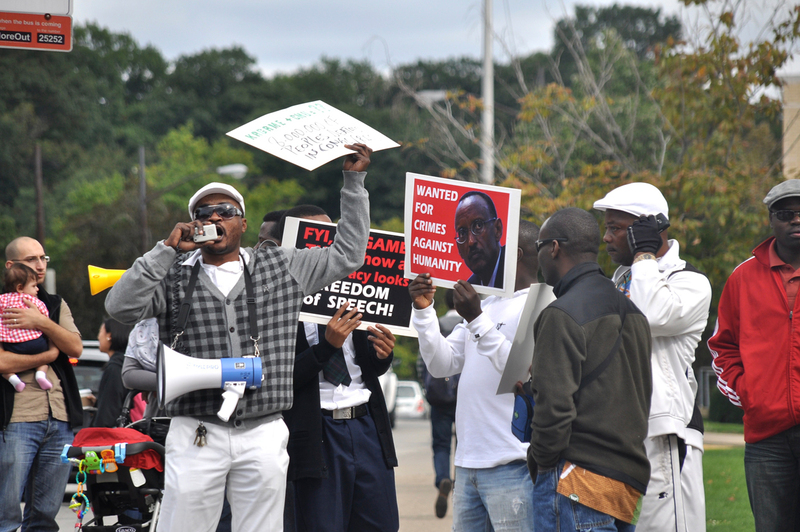 Not everyone agrees that Kagame’s freedom of speech record is so straightforward. 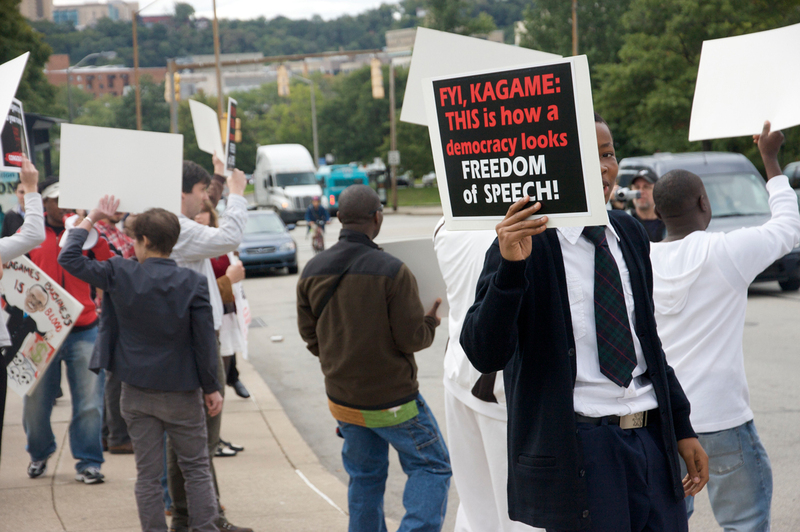 A counter-protest consisting largely of Rwandans carrying signs of support for Kagame appeared outside the University Center shortly after Cech’s group. “To see where [Rwanda] has come is just a remarkable story,” counter-protester Godfrey Biravanga said. “Granted, we have a long way to go, but to suggest that Rwanda is not on the right track is just ridiculous.” According to University of Pittsburgh law professor Charles Jalloh, who specializes in international human rights law and regularly visits Rwanda, the truth about Kagame’s human rights record is complicated. Jalloh said that the Rwandan laws repressing freedom of speech — the ones that were used to justify the arrest of Kagame’s political opponents — are ones that attempt to suppress genocidal ideology and ethnic divisions such as the one between the Hutus and Tutsis. Cohon said that he takes the university’s reputation very seriously, but that he too thinks the situation is more complex than the protesters make it out to be. “One of the things I’ve learned personally, and I think I’m probably typical among those of us who look carefully at Rwanda, is how complicated and nuanced a country in that situation can be,” Cohon said. The protesters also carried signs and shouted chants accusing Kagame of the murders of millions of Congolese. One common chant was, “Kagame, genocidaire.” Genocidaire is a term for a perpetrator of genocide. In 2009, the United Nations released a report that alleged that Rwanda may have committed genocide on the Hutu people during its 1996–97 pursuit of Hutu perpetrators of the 1994 genocide who had fled to the neighboring Democratic Republic of the Congo, then called Zaire. The report said that the large number of innocent Hutu civilians who were killed or harmed suggested that they were not merely collateral damage, and that the intent of the Rwandan military may have been to destroy the Hutu people “in whole or in part,” in accordance with the definition of genocide in international law. However, the report also raised doubts about this intent, noting that the Rwandan military also spared Hutu lives and helped many Hutu back into Rwanda. The Rwandan government issued an official rebuttal of the report, denying any claims of genocide and saying that the report used “flawed methodology and application of the lowest imaginable evidentiary standard.” There have also been allegations that Rwanda is exploiting Congolese mineral resources. According to Cech, the amount of minerals which have recently been officially exported from Rwanda does not physically exist within the country. “Part of [the success of Rwanda] is that it’s built on the backs of the Congolese, who have really paid the price in human life,” Cech said. Carnegie Mellon professor of social and decision sciences and former Assistant Secretary of State for African Affairs Jendayi Frazer, however, says that though many Congolese believe that Rwandans are to blame for the instability in their country, the issue is more complicated than that.